The IOS Press Neuro Journals Collection features a portfolio of international, rigorously peer-reviewed journals that promote translational medicine. They are dedicated to advancing research, identifying preventive methods, improving diagnosis and treatment and working towards finding a cure for neurodegenerative and other neurological disorders. The pricing for this collection enables your library to offer your user community full online access to 8 important journals at a 20% discount price. TAKE ADVANTAGE OF SUBSTANTIAL DISCOUNTS WHEN SUBSCRIBING TO MULTIPLE TITLES FROM THE COLLECTION. You can also choose to subscribe to individual journals or purchase on a per-article basis. There is also the option to avail of substantial discounts when you subscribe to the 4 journals in the IOS Press Neurodegenerative Disorders Journals Collection – see here for details. 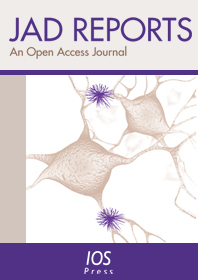 Unlimited access to the IOS Press Neuro Journals Collection for up to three months. Support to promote the trial across your institution and usage statistics will be supplied. The Journal of Alzheimer’s Disease (JAD) is dedicated to providing an open forum for original research that will help expedite our fundamental understanding of Alzheimer’s disease. Groundbreaking research that has appeared in the journal includes novel therapeutic targets, mechanisms of disease and clinical trial outcomes. JAD’s anniversary issue, celebrating 20 years of the journal, was published as a fully open access issue in March 2018 (vol. 62, iss. 3). Designed to promote the exchange of ideas and disseminate original research in basic sciences, translational research, and clinical medicine that will expedite our fundamental understanding and improve treatment of Parkinson’s disease. Facilitates progress in understanding the genetics, molecular correlates, pathogenesis, pharmacology, diagnosis and treatment of Huntington’s disease and related disorders. Facilitates progress in understanding the genetics, molecular correlates, pathogenesis, pharmacology, diagnosis and treatment of neuromuscular diseases. This journal provides scientifically based, practical information relevant to all aspects of neurologic rehabilitation and the full life span and range of neurological disabilities including stroke, spinal cord injury, traumatic brain injury, neuromuscular disease and other neurological disorders. Publishes papers relating the plasticity and response of the nervous system to accidental or experimental injuries and their interventions, transplantation, neurodegenerative disorders and experimental strategies to improve regeneration or functional recovery and rehabilitation. Provides an avenue for communications that spans the basic and applied areas of vestibular science. It publishes experimental and observational studies, review papers and theoretical papers based on current knowledge of the vestibular system. Explores the nervous, endocrine and immune systems from a regulatory network perspective, including physiologic and pathophysiologic processes. The Journal of Alzheimer’s Disease Reports (JADR) is dedicated to providing an open forum for original research that will expedite our fundamental understanding of Alzheimer’s disease. The editorial leadership of JAD and JADR is working closely together to provide the AD community with greater and faster access to the breadth and depth of relevant content in this field. Covers modifications to neural circuits in the developing and adult brain, whether by learning or physical activity, spine formation, changes in neural structure, changes in neural networks, new cell division, as well as response of the CNS to experimental injuries, neurodevelopmental and neurodegenerative disorders.